Heritage is the root of a people’s history and the bedrock of their future. It should be seen as precious and appreciated as a fountain of inspiration. Our heritage should be protected as a pillar of the past and an enhancement to the future. Without a heritage, people are rootless and drift through life without knowing or understanding where they came from or where they are going. Preserving our heritage therefore helps to generate civic pride and foster a sense of empowerment and a national identity. Our arts are considered to be an integral part of our Cultural Heritage. They constitute a community’s cultural asset. They are essential to a community’s well being, economic and cultural vitality and sense of identity. Our arts represent an outlet of expression and they are also a physical manifestation of our internal impulse. In times past they served as a vessel for storytelling and conveyed mankind’s relationship with its environment. Therefore, the preservation our arts should be paramount. Then our Archives; records that are of lasting value to society and as such are worthy of preservation. They are records of human activities and can be vital for providing an audit trail for evidential, research, accountability and legal reasons. Archives provide verification of transactions by governments, organisation or individuals. Things such as legal documents, minutes of meetings, charts, maps, deeds, diaries, wills and birth certificates should all be preserved and treasured as a record of the people who passed through our communities. The contents of these archives can influence future historical study and our understanding of where we have come from and who we are. Together they form our collective memory, testament to the shaping of our identity. The Nevis Island Administration is committed to preserving our archives. That is why, on 19th January, 2016 with assistance from the British Libraries Services, we commenced a project and opened the Digital Archive Unit. In the initial stages, this project will seek to preserve our Court documents, but it will eventually expand to include all of our island’s archives. The preservation of our marine environment is critical to our existence. Our oceans are the largest ecosystems on Earth and they are the Earth’s largest life support systems. To survive and prosper, we all need a healthy marine environment. Our oceans generate half of the oxygen we breathe. At any given moment, more than 97 percent of the world’s water resides in oceans. Oceans provide a sixth of our annual protein consumption. Furthermore, our oceans absorb carbon dioxide from the atmosphere and reduce the impact of climate change. The preservation of our marine environment is of vital interest for human kind. Our security, our economy, our very survival depends on this. Finally, allow me to congratulate and applaud the Nevis Historical and Conservation Society, along with the Brimstone Hill Fortress National Park Society and the St Kitts National Trust, for their collaboration in hosting this year’s History and Heritage Month. 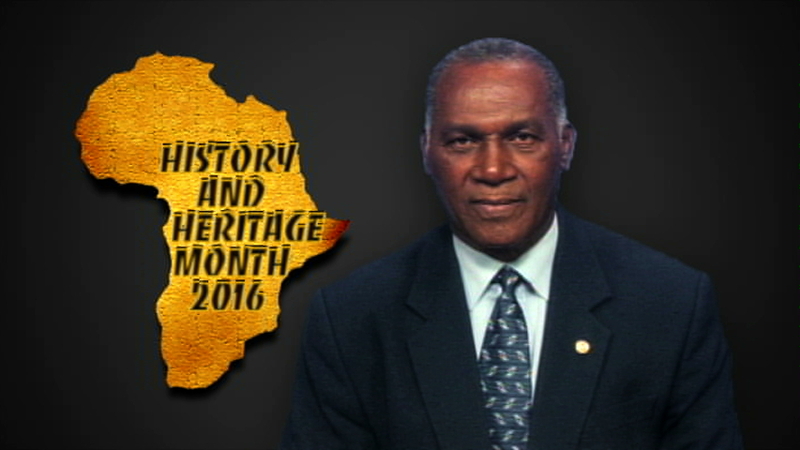 For the past 10 years you have remained vigilant in promoting and preserving our history and heritage. Through your dedication and commitment, you have stimulated our self-awareness and fostered civic and national pride. As a Government, we recognise the critical role that you play in our society and wish to express our gratitude to you for the yeoman service you provide. May all of your hard work and efforts continue to yield bountifully and may this year’s celebration be crowned with success. Thank you and have a wonderful celebration of History and Heritage month.